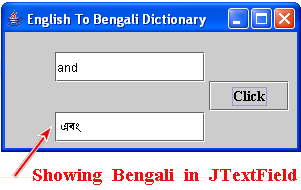 Java English to Bengali (Bangla) Dictionary: How to read or search Bengali word from a file or notepad and then show it in JTextField. Today I am sharing with you another important topic where I will give you an example by which you will get a clear idea about how to read or search any Bengali or Bangla font from a text pad (notepad) or file and then show it in JTextField. This code is important for those who are trying to prepare English to Bengali Dictionary. Download the reader.txt which I have used here to read Bengali (Bangla) words. Copy the following code and run it by keeping reader.txt in the same folder.